A 52-year-old man with a history of sarcoidosis presented with continuous right flank and back pain for four months. Contrast-enhanced CT abdomen and pelvis revealed a lobulated soft tissue lesion extending from the aortic bifurcation to the anterior margin of L5 that measured up to 8 cm in craniocaudal dimension, and contained peripheral ring like foci of calcification. The right kidney was not visualized. 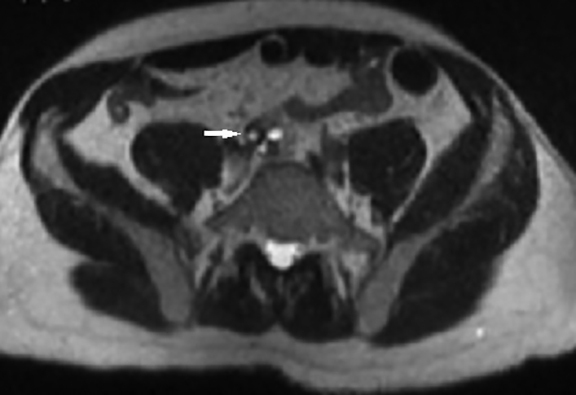 Review of a CT performed four years prior demonstrated stability of this lesion. The presumed diagnosis of ectopic kidney was confirmed with a cystoscopy with retrograde pyelography. The patient was counseled that the presence of the ectopic kidney was unlikely to be the cause of his pain. However, due to significant pain and patient anxiety, which was due in part to the delay in diagnosis, the ectopic kidney was surgically removed at the patient’s request. Postoperatively, the patient reported the right flank and back pain was improved for a “short period” but more recently he reported that it was coming back. He is being managed with pain medications, including Tylenol. The initial contrast-enhanced CT abdomen and pelvis performed for workup of the patient’s abdominal pain demonstrated a lobulated soft tissue lesion at the level of the aortic bifurcation extending inferiorly to the anterior margin of L5 (Figure 1). It was slightly lower in attenuation compared to muscle, measured 2 × 3 × 8 cm (anteroposterior × transverse × craniocaudal), and contained peripheral ring like foci of calcifications. The right kidney was absent. The lesion was also partially visualized on two sequences (T2 and T1 45 minutes post-gadolinium delayed) of an MRI that was performed for further characterization of a gallbladder abnormality. The pelvic lesion demonstrated round T2 hyperintense cystic foci (Figure 2) and diffuse enhancement (Figure 3). The initial differential included neoplastic lesions, such as lymphoma and carcinoid. 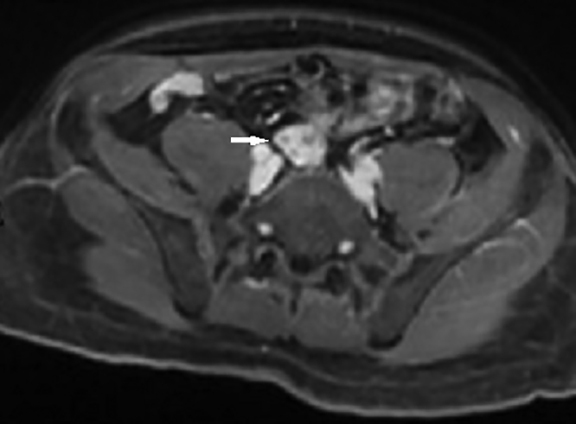 However, when an old CT abdomen and pelvis performed four years prior became available for review that demonstrated stability of the lesion, a benign etiology for the lesion, such as ectopic kidney, became the presumed diagnosis. 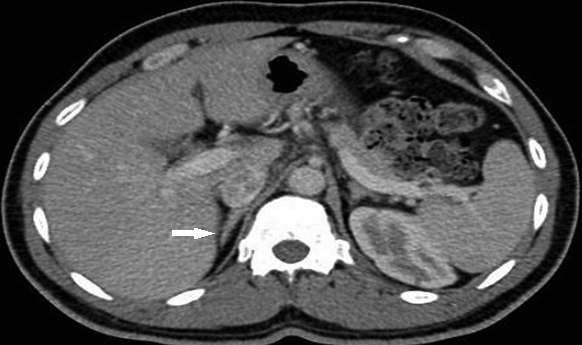 In retrospect, a linear configuration of the right adrenal gland was observed on CT (Figure 4). Cystoscopy with retrograde pyleogram was performed for confirmation of the diagnosis. On cystoscopy, the right ureteral orifice was noted along the right trigonal ridge; however, it was located significantly more distal and medial than would be expected. 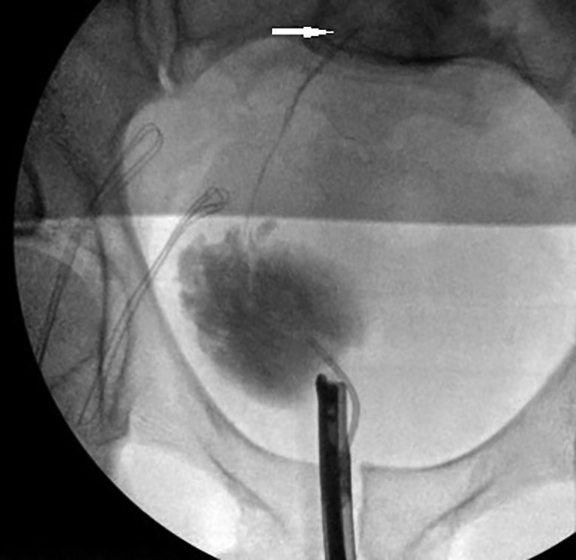 Retrograde pyelogram demonstrated a small but patent ureter that extended to the level of the lesion (Figure 5). Dysplastic ectopic pelvic kidney. 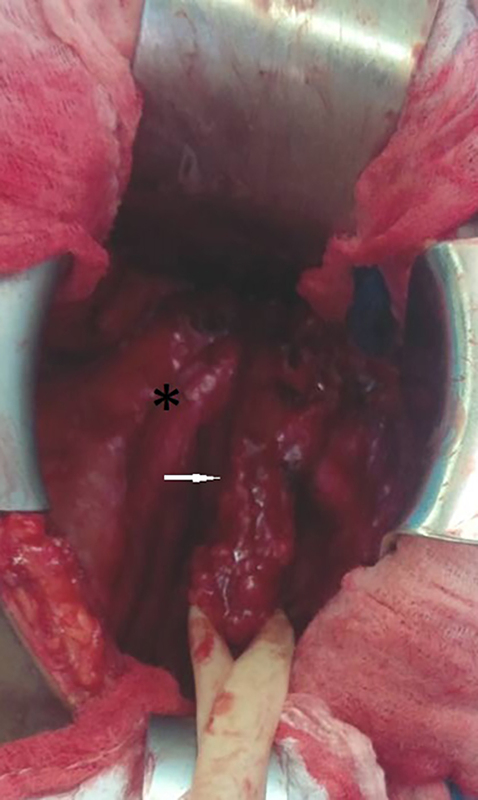 The diagnosis was confirmed pathologically with intraoperative (Figure 6) and histopathologic images provided (Figure 7). In a patient with an empty renal fossa, it is more common for the patient to have an ectopic kidney rather than renal agenesis. Ectopic kidneys may be dysplastic in appearance with variable size, shape, and rotation. It is important to be aware of the possibility of having an ectopic kidney and that it may have an atypical appearance to avoid misdiagnosis and potentially unnecessary surgery or biopsies. Glassberg KI. Normal and abnormal development of the kidney: A clinician’s interpretation of current knowledge. J Urol. 2002;167(6):2339-2350; discussion 2350-2351. Hoffman CK, Filly RA, Callen PW. The “lying down” adrenal sign: A sonographic indicator of renal agenesis or ectopia in fetuses and neonates. J Ultrasound Med. 1992;11:533-536. Gulsun M, Balkanci F, Cekirge S, Deger A. Pelvic kidney with an unusual blood supply: Angiographic findings. Surg Radiol Anat. 2000;22:59-61. Lin VC, Weng HC, Kian-Lim E, Lin IC, Yu TJ. 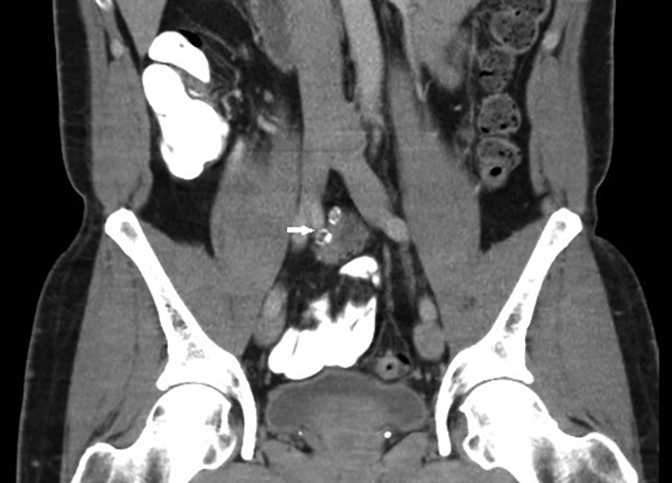 An atrophic crossed fused kidney with an ectopic vaginal ureter causing urine incontinence. Urology. 2010 Jul;76(1):55-56. Cinman NM, Okeke Z, Smith AD. Pelvic kidney: Associated diseases and treatment. J Endourol. 2007 Aug;21(8):836-842. Guarino N, Tadini B, Camardi P, Silvestro L, Lace R, Bianchi M. The incidence of associated urological abnormalities in children with renal ectopia. J Urol. 2004 Oct;172(4 Pt 2):1757-1759. 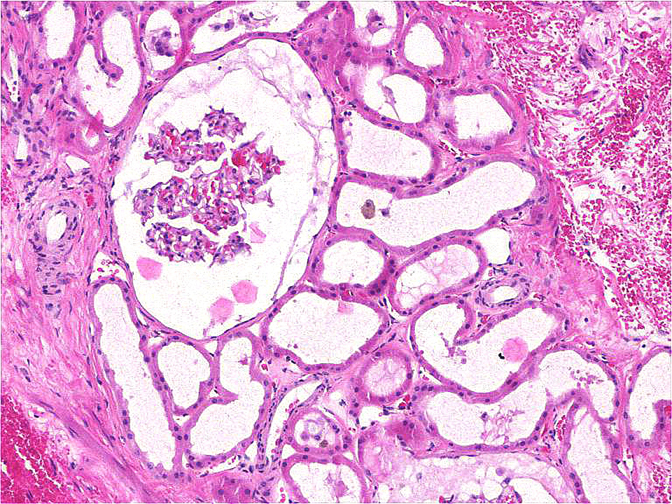 Daginawala N, Qin H, Lerner L, Jati A. Ectopic dysplastic kidney. Appl Radiol. 2016;45(12):28-30. Prepared by Dr. Daginawala while serving in the Department of Radiology at Boston University Medical Center in Boston, Mass. ; Dr. Qin while in the Department of Pathology, Dr. Lerner while in the Department of Urology, and Dr. Jati while in the Department of Radiology at VA Boston Healthcare System in Boston, Mass.